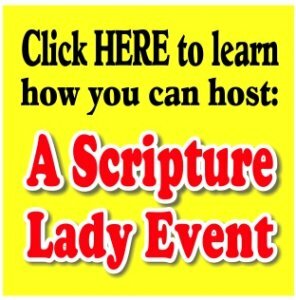 Invite the Scripture Lady to present her elementary Bible song program “Make Every Effort” – a fun Scripture-filled musical presentation based on 2 Peter 1:5-7. What a great truth to share with our young ones who are growing in their faith in God. This program will challenge your kids to grow in areas that this wonderful verse proclaims through Bible verse songs, Bible review games and creative Gospel Magic object lessons. The children are then encouraged to learn a little bit more about each of the ways Peter asks us to grow in our faith in God. The first area of growth is our faith. Using a fun and simple object lesson using a tennis ball, golf ball and some beans, Kathy shows the children that no matter what, they need to put their faith in God first. If they do, everything else in their lives will fall into place. The next area of growth is goodness. The Bible says that only God is truly good. In fact, He is the Good Shepherd and we must all learn to hear His voice lead us into truth. Kathy plays a fun audience participation game called “The Good Shepherd’s Voice” to teach this important lesson. After we grow in knowledge, we should move onto self-control. At this point, Kathy breaks out one of her favorite games that audiences have loved for several years now called, “My Identity in Christ.” This game is designed to encourage self-control while learning more about what it means to be a Christian. Perseverance is up next and Run With Perseverance is the perfect Bible verse to sing and share with all the children on this topic. Finally, Peter exhorts us to grow in our love for one another. The Scripture Lady showcases one of her favorite object lessons that will have your kids saying, “Wow! That’s awesome!” They will learn that God indeed wants our love to grow and it will when pray and ask Him to cultivate His love in our lives. The program then ends with Kathy and the children singing, Oh How I Love Jesus as a way to say “Thank you!” for all the ways that they can grow in God.